The fans came alive as their team entered the venue. They chanted and raucously waved flags in anticipation of 60 minutes of chaos. But this wasn’t just another football game. It was Super Bowl Media Day. The Seattle Seahawks’ 12th Man was ready, even sitting in a basketball arena watching thousands of media members interview the players. “The 12s, they roar wherever we go,” Seattle safety Kam Chancellor said. The scene at US Airways Center, home of the Phoenix Suns, reaffirmed what fans have learned in the last few years: Seahawks supporters are loud and proud. The NFL again sold tickets to media day and fans of all allegiances scooped them up at $28.50 a ticket. The price included a small radio set that picked up feeds from each podium. Aaron Patterson, a Cardinals fan from Chandler, was impressed with Sherman’s intellect as he listened to the former Stanford cornerback. Patterson couldn’t wait to hear what Seahawks running back Marshawn Lynch would say. He was a minute too late. “By the time I figured out what channel he was on, he was gone,” Patterson said. 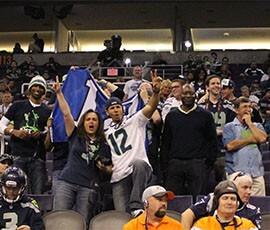 The New England Patriots were well represented in the stands. Stephen Marshall, who grew up in New Hampshire, switched work shifts to attend. “You watch these guys on TV all your life and now you can see them in person talking about the game,” he said. Patriots quarterback Tom Brady was surprised fans paid nearly $30 to attend. New England defensive tackle Vince Wilfork was happy to see a strong turnout of Patriot supporters. “When you come to an event like this, you get to see your fans from everywhere,” he said. She was in good company Tuesday. 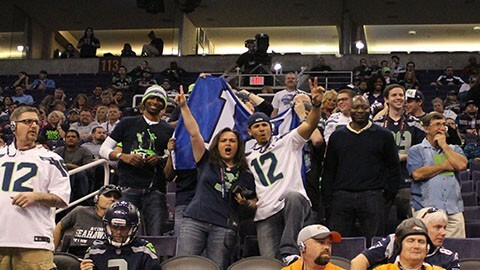 Seattle Seahawks fans make their presence known at Super Bowl Media Day.